The rapper shared on Instagram that he is "embarrassed & apologetic beyond words"
Rapper G-Eazy performs as a special guest on the Coachella stage during week 1, day 3 of the Coachella Valley Music and Arts Festival on April 15, 2018 in Indio, California. G-Eazy took to Instagram on Sunday to address his conviction in Sweden last week. 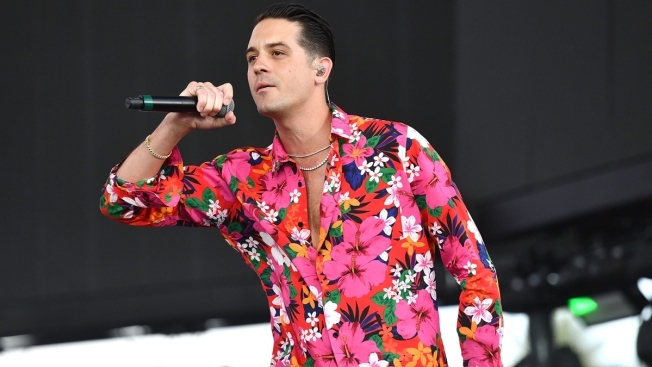 Following his arrest and conviction of assault, drug possession and resisting arrest in Sweden earlier last week, G-Eazy, who was born Gerald Gillum, is "grateful" to be a free man, the rapper said Sunday on social media. On Friday, G-Eazy avoided jail time but was sentenced to two years of probation and ordered to pay 80,000 krona (around $9,000) for his crimes, and a restitution of 6,500 krona (about $810) restitution to the security guard he allegedly assaulted, People reported. On Sunday, G-Eazy took to Instagram with a lengthy post. The 28-year-old wrote, "Grateful & blessed to be free & safe. Happy to be in Copenhagen tonight doing what I love most. Embarrassed & apologetic beyond words about the incident, but above all I'm so f-cking grateful they let me go, craziest experience of my life, awful night with a lot of bad luck and some even worse decisions but like I said I'm grateful as f-ck to be a free man, back on tour performing for the fans." He added,"Thank you to everyone who's held me down along the way and supported this journey, I appreciate you more than you'll ever know. Love." TMZ reported that G-Eazy was partying in a club and "acting belligerent" when security approached the rapper to get him to calm down. That's when G-Eazy allegedly "started throwing punches, striking one guard in the face," according to the site, which added that when police then detained G-Eazy, they allegedly found cocaine in his pocket. After that is when things got rowdy.